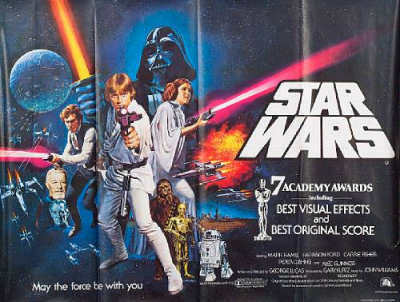 In 1977 George Lucas’s Star Wars was released in cinemas all over the world. The film revolutionised the cinema industry, and the two sequels, The Empire Strikes Back, & The Return of the Jedi, and three prequels have all enjoyed massive box office success. Pictured right: Star Wars, 1977 UK Quad Oscars version, folded, ondition B, art by Tom Chantrell; and Return Of The Jedi, 1983, rolled, condition A, both UK Quad, 30 x 40in sold for £418 ($700) at Bonhams, November 2004. Around the films has been built a massive merchandising industry which seems set to grow as a new generation of fans arrives willing to buy figures, comics, posters, autographs, cells, games, puzzles, light sabres, masks, stationary, videos of the films, videos of the making of the films, display pieces, promotional material, Pez dispensers, Tazos etc etc etc. As the appetite for Star Wars collectables continues, the values of rarer objects and hard to find pieces increases. In the last few years prices of Star Wars toys have risen markedly. This is partly due to the increase in Star Wars collectors as a whole, and also due to a growing awareness among the general public as to the investment value of collectables. The appearance of new Star Wars novels such as ‘Heir to the Empire’, the 20th anniversary and the re-release of the films has also fuelled collectors and speculator interest. Pictured left: A collection of 10 Star Wars action figures in original packaging 1977, including an Arto-Detoo, two C-3PO, two Han Solo, two Princess Leia, two Obi-Wan Kenobi, a Darth Vader; together with two Star Fleet die-cast defenders and one Space Glider figure sold for $600 at Bonhams & Butterfields, December 2008. Toys that could be bought for a few $ or back in 1977 now fetch many hundreds of $ or . 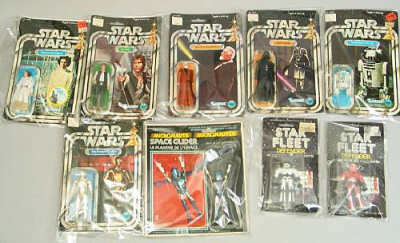 Kenner were a fairly new company back in 1977 and were able to buy the toy license for the Star Wars trilogy of films. They produced hundreds of figures, vehicles and accessories for the three films up until 1984. The first series of Kenner figures produced from 1977-1979 included a Jawa with plastic cape which can now fetch around $1,000 if in mint condition. Collectors pay a premium for boxed figures, upto 10 times as much for certain figures. Kenner began producing Star Wars toys again in 1995. Some of the newer figures are becoming very sought after already. Exclusives and mail aways have always been sought after. These are often limited editions so are difficult to get hold of. Sears had an exclusive Cantina Adventure Set to tie in with the original Star Wars feature which can now fetch nearly $500. There have been several new exclusives including a translucent Obi-Wan Kenobi available with Lay’s Potato Chips, and a Star Wars Insider exclusive of Figrun D’An. These a re almost certain to become very collectable, especially outside of the US where these figures are more difficult to find. 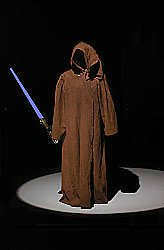 Pictured left: The original Obi-Wan ‘Ben’ Kenobi’s cloak worn by Sir Alec Guinness in the masterpiece science fiction adventure, Star Wars (1977) sold for £54,000 in Bonhams Costume Sale in March 2007. Aside from action figures there has been a great deal of interest in Star Wars comics. The original comics were produced by Marvel, and until a couple of years ago it would have been possible to buy a complete run fairly cheaply. Prices for these comics have sky rocketed, although interest in the slightly larger format produced for the UK market has been considerably less. Dark Horse have been producing the new Star Wars related comics for the last couple of years, with an ever growing array of titles including R2-D2 and C3PO in their own Droids mini-series. The Dark Empire series produced by Dark Horse was a sell out and already risen in value to be about four times its cover price. The present demand for merchandise looks here to stay, but the market is very fragile and people should collect things they like and not because one day it might be valuable. Items that are available only in certain countries are always popular in other countries. Part of the fun of collecting is having something that your friends and other collectors want.